I had the great fortune (and I do mean that) of growing up in a home where the preparation of nutritious delicious food made with love and served that way was the norm. I never thought much about it until I started feeding my own family. What we put into our bodies isn’t just fuel, it nourishes the entire being. I would love to think that passing my recipes on to my children and those who may follow (no pressure!!) will pass that love along as well. Over the next several months as I cook for my family, I’m going to share some of my kitchen staples that are in pretty regular rotation around the house. Everything that I make myself can be bought packaged and ready to go in the grocery store but none that I’ve come across so far (artisanal specialties aside) are anywhere near as good. That’s my humble opinion. I am an adopter and adapter of recipes and hope that anyone who might try these recipes is as well. Like less salt? use less. Like it spicier (you go!)? goose the flavor. Worse case when you’re experimenting in the kitchen is you need to make PB&J or order take out. Just open a bottle of wine and all will be well. 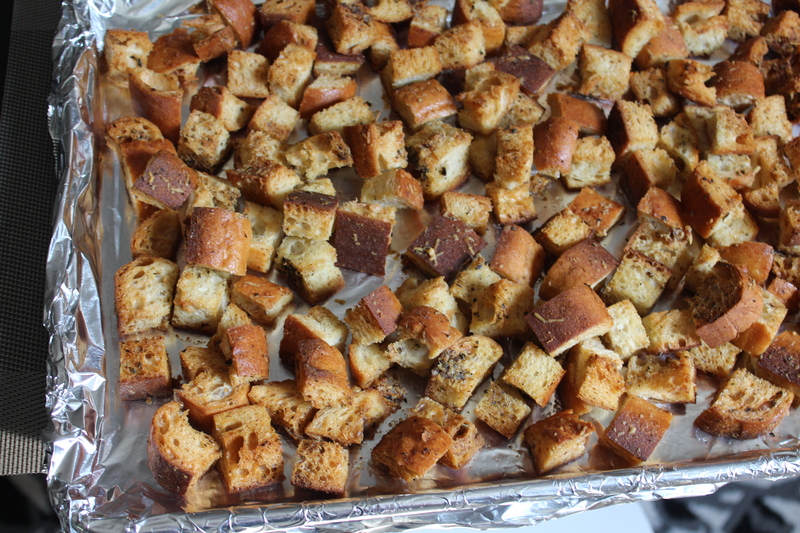 I’m starting with croutons since I’m making a Cobb Salad for dinner and needed them anyway. This recipe is one that I’ve gotten from my mother though Monica tells me that Mom uses butter in her croutons. I haven’t taken the time to check with her but I’ll try that next time. So, in five easy pictures, croutons! This recipe is for a standard baguette. Make sure it’s got a crisp crust otherwise the croutons will disintegrate pretty quickly when in a dressed salad. 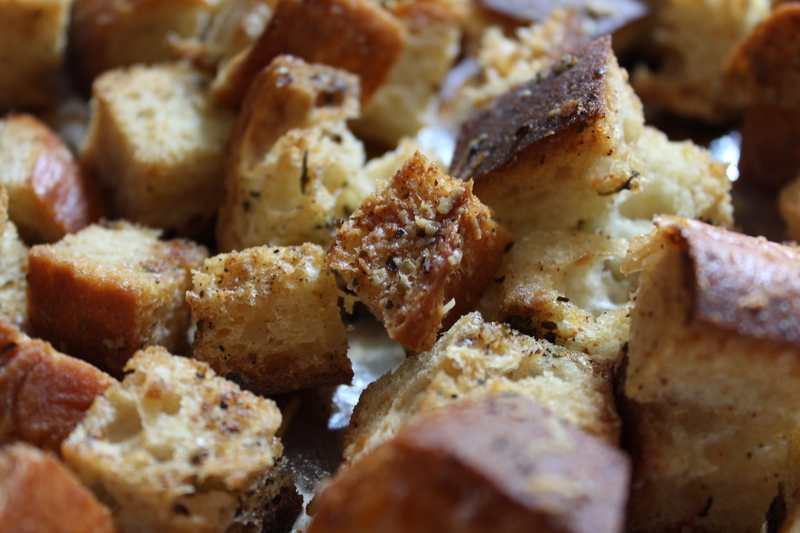 Croutons are a great way to use up day-old bread. Even if you aren’t making croutons (the travesty! ), if you’ve got leftover baguettes or good bread that’s gotten stale, whiz them up in the food processor and keep in the freezer to use as fresh breadcrumbs. 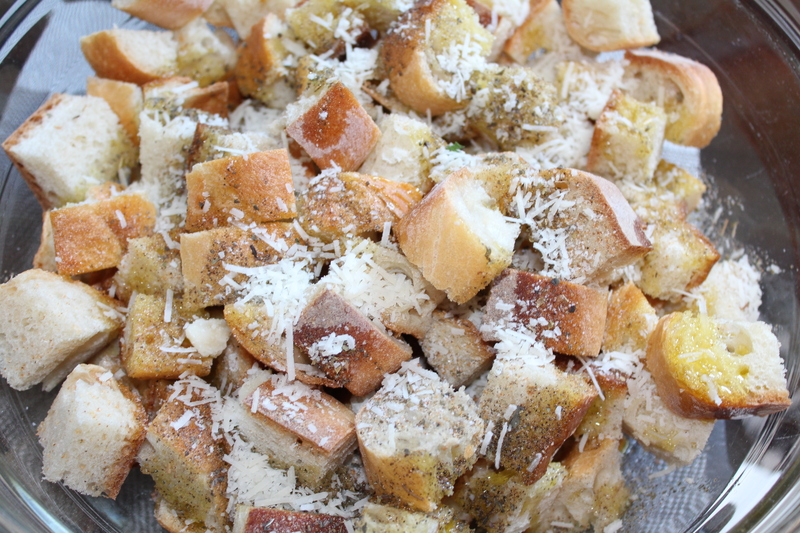 Cut the baguette into small cubes, about 1 in, and toss into a bowl. There are times that I become impatient and end up with 2 inch or so cubes. When the unsuspecting diners (and even suspecting) bite into their crunchy deliciousness, they experience cranial tremors and can’t hear anything happening outside their head. Great “accident” to have when the in-laws visit. Ah, I jest. Anyway, while still fabulously flavorful, it’s far more user friendly to cut the cubes small. Pour the oil and sprinkle all of the other ingredients over the bread and toss to thoroughly disperse the flavors. The recipe below is the standard recipe that I use but by no means the only way that I make croutons. While I always stay with the oil, salt and pepper basics, this recipe is for a crouton that goes well with a green salad; in this case, it’s a Cobb Salad. Sometimes, I’ll use chili powder, cumin and sometimes a hot pepper powder if I’m making a taco or similar salad. Or I’ll use Tarragon instead of the other herbs if I’m going more the French recipe route. In these flavor profiles, I do not add the Pecorino Romano cheese since, to me, that’s a distinctly Italian flavor. I simply omit the cheese. 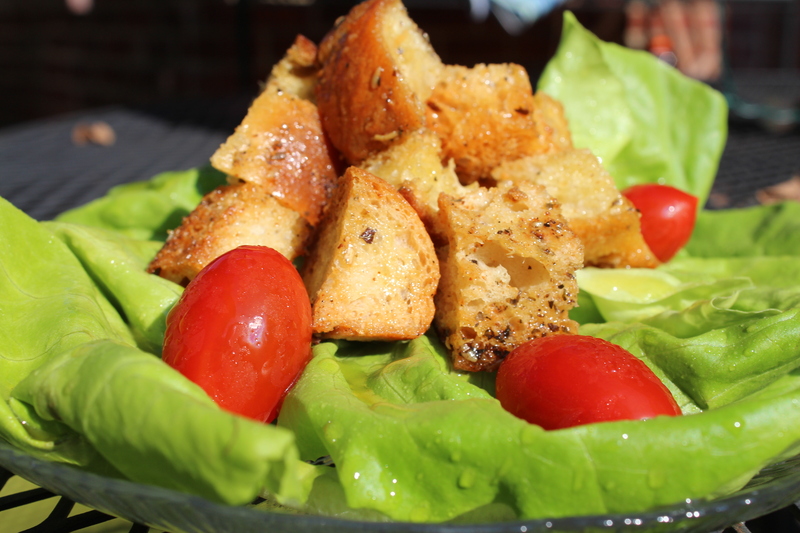 Croutons are basically bread with salt and pepper so can morph quite easily … have fun with it! Finally, toss everything onto a pan (I always use foil-lined since I’m lazy and hate cleanup) in a single layer or as close as you can get and put into the oven to bake until they are browned and crispy. Don’t be tempted to pull them too early. They need a good deep brown color. After you’ve tested a few, used some on a salad, and tested a few more … by the way, they are delicious with a glass of red wine … they keep quite nicely in an air-tight container. I have a vacuum sealer which I use on delicate and seal before they get crushed if I’m not using them within a few days. They also freeze well in an air-tight container or plastic freezer bag with as much air smooshed out as possible. Cut the bread into 1 inch cubes and put into a large bowl. Drizzle the olive oil over and sprinkle the seasonings over and toss thoroughly to combine. Put onto a sheet pan in a single layer if possible and bake in the center of the oven for 25 minutes or until nicely browned (that is past tan but before black). If you’re not sure, pull one out and taste it. There should be only crunch, no chewiness. This entry was posted in Bread, Salads, The Basics and tagged bread, croutons, family dinner, salad, the basics, wine. Bookmark the permalink.